Home2 Countries, 1 Day, 1 Run! 2 Countries, 1 Day, 1 Run! December 21st, Day #57 of the running streak! I had ran about 3 miles earlier in the day, it was Sunday and I wanted to make sure I could enjoy the Ravens game without worrying about running when the game was over. I met a few friends at Tin Roof, it is a bar in downtown Baltimore, near Power Plant Live. There wasn’t much I could eat there, bars never seem to have vegetarian options. There were a few things on the menu I could get one being a quesadilla with avocado, various peppers, mushrooms, and cheese on it, so that is what I ordered. My friends and I watched the Ravens get run over by the Texans, it was a lackluster game to say the least. Towards the end of the third quarter an idea popped into my head to take a spontaneous trip! I had the next two weeks off from work and nothing really planned, so I started googling places to go. Airfare was pretty steep for most places since I had waited till the last minute, so I started thinking about places I could drive to. “Who wants to go to Niagara Falls?” It was an open invitation to my friends at the table, some looked at me puzzled and one asked me when? I said right now, it’s only about a 6 hour drive! I almost got my one friend to go but then she decided not to. I was trying to convince someone to be spontaneous with me, but it wasn’t working. The waitress came and asked if we needed anything else, I said “May I ask you a question?”, she replied “Sure”. “Are you spontaneous?”, I asked. She said, “Yes!”. 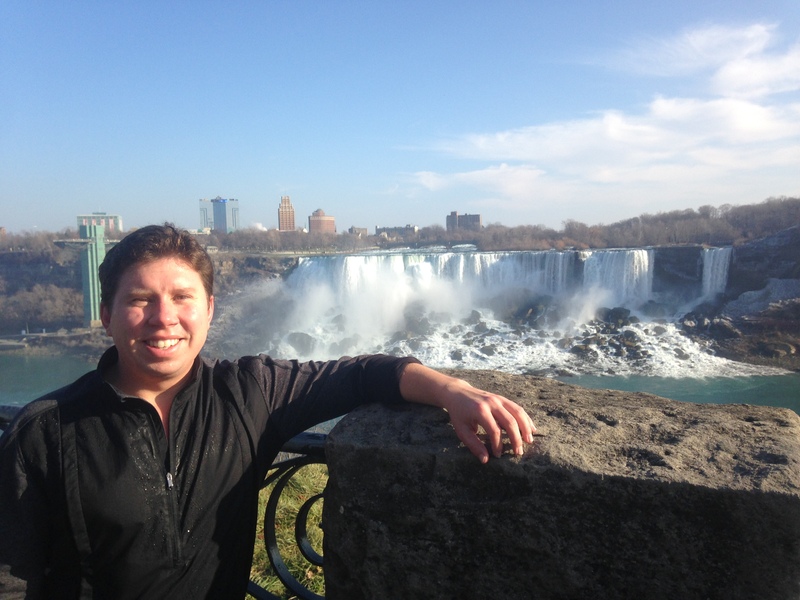 So I followed up with, “If someone asked you on a whim to go to Niagara Falls, would you?”. She quickly replied, “Yes, I’ve never been there.” So I figured why not ask. When I asked her to go it seemed like she actually considered it for a second or two, then declined. I told her I would take my check, I had to get on the road! My friends didn’t believe that I was going to go, but I was! I stopped at my house and packed a change of clothes, some running gear and I was on my way. My check oil light had come on, so just to be safe I stopped and got some oil to put in my truck. I am glad I did, somehow my truck had burned almost 5 quarts of oil, so I could have had quite the problem had I not stopped. 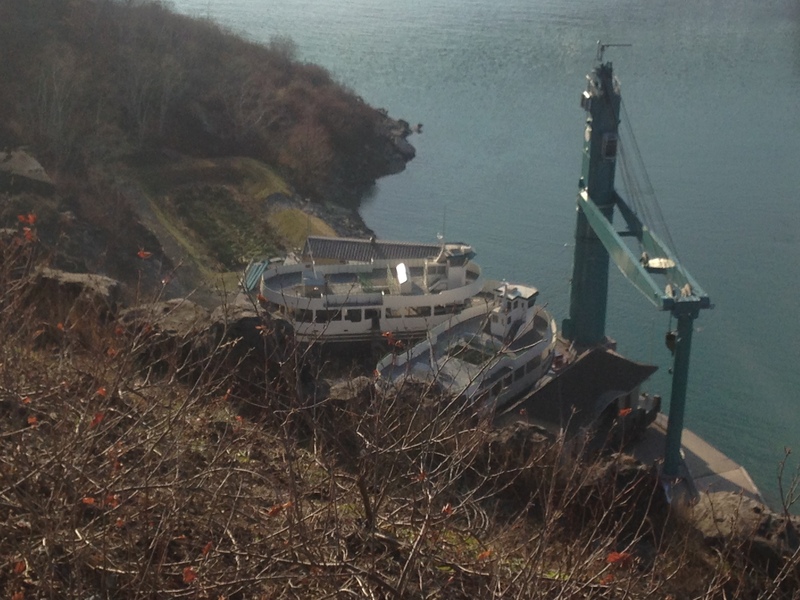 After filling up the oil basin I was on my way to Niagara Falls. When I left Baltimore, it was about 8 in the evening so I would be getting there really late. I don’t mind driving at night and I don’t mind long drives. Most of the time I actually choose to drive, instead of fly, given the option. I don’t have anything against flying, I just like that when I am visiting somewhere I can drive if I need to run to the store or something. I used the Waze App for navigation, it took me on some backroads through Pennsylvania, I stopped to get gas in a one stoplight town along the way. While I was on the highway about 2 hours outside Niagara, I saw a glowing in the sky, it looked like a huge fire in the woods. It was getting brighter and seemed very large as it reflected off the low cloud cover, after about 10 mins of driving, I could tell it was an oil refinery burning off something. Thank goodness it wasn’t a wildfire. My drive up to Niagara was pretty uneventful, I was surprised when I got close to Buffalo I could still pick up a Baltimore AM radio station, WBAL 1090. I guess other than the cloud cover near the oil refinery it was pretty clear and the signal could carry really far. Yes, I do listen to AM radio; at night when I’m driving I usually listen to Coast to Coast, for a good laugh and just to keep the drive interesting. 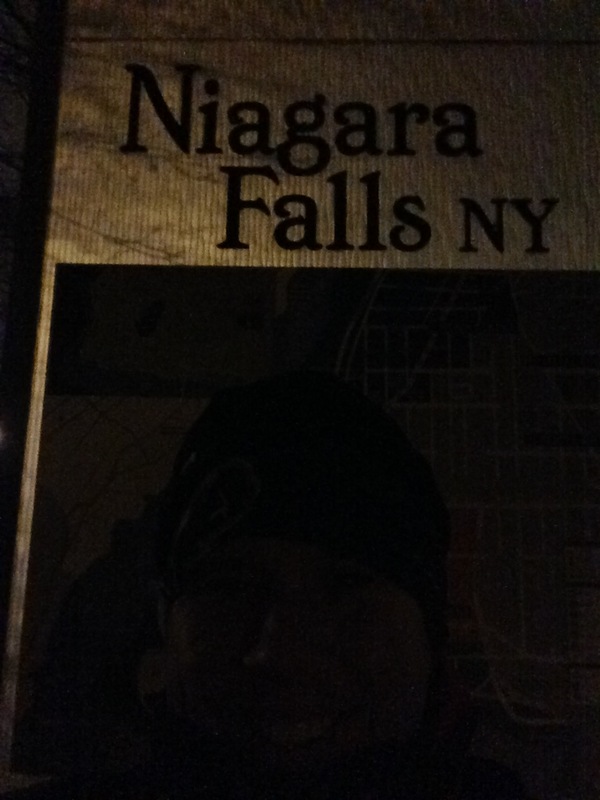 As I got close to the Falls there was some construction going on so I followed the detour signs and at just about 3am, on what would be Day #58 of the running streak, I pulled into the parking lot adjacent to Niagara Falls. Surprisingly the park never closes, not surprisingly I was the only one there and it was cold. If I remember correctly I think the temperature was close to 16 degrees. When I stepped out of my truck I could hear the Falls raging as the water flowed over. I decided I would walk around a bit, so I bundled up and went for a stroll. It was icy along some the pathways because of the mist from the falls. There were huge ice chunks in the river, which was cool to see. 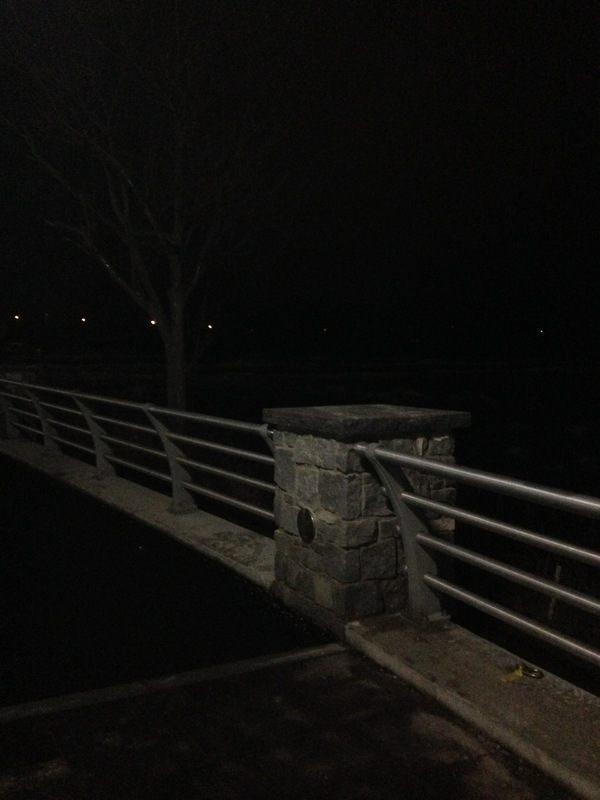 The lights were not turned on at the Falls, I found out later they turn those off at 11pm. I couldn’t see a lot of the Falls but as I walked closer to were the water goes over, the noise from the raging water grew louder and finally you could see the edge where the water drop into the abyss. 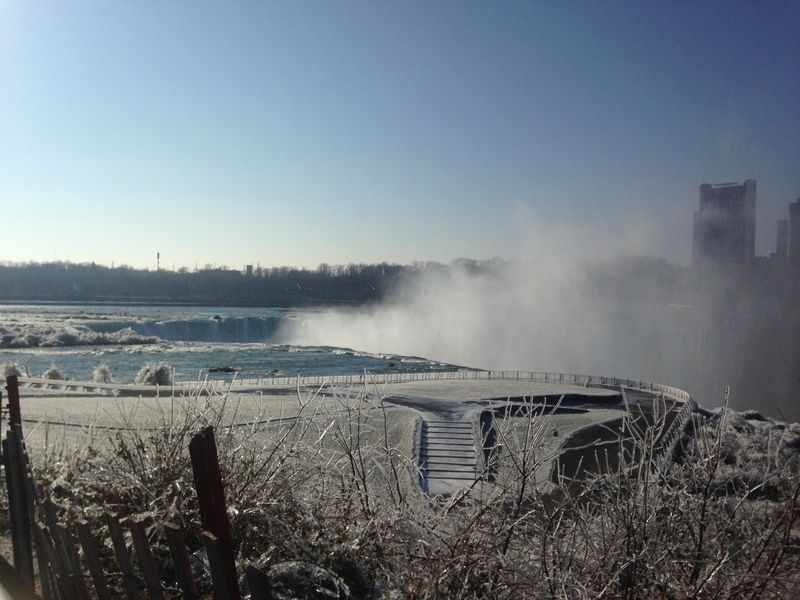 There was lots of ice and it was so cool to Niagara like this. I hadn’t been here in more than 15 years. I walked around a little more and tried to take some photos, but the flash on my phone wasn’t working, so they didn’t turn out so great. It was getting late or early depending how you look at it and I was pretty tired after the drive. I have a pretty spacious truck, so instead of getting a hotel I opted to find an empty parking lot close by where there weren’t any parking restriction signs and get some shuteye. I woke up around 7am to the sound of some construction worker replacing some sort of piping at the end of the parking lot. 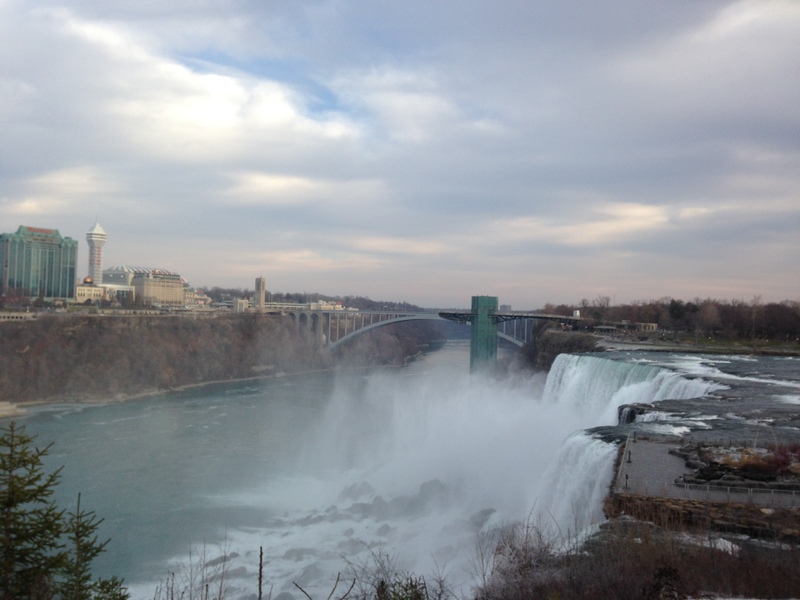 I decided I should go see the Falls during the day. I was in awe, it was better than I remembered it. It is an amazing site to see that much water constantly flowing over crashing onto the ice, rock, and river below. 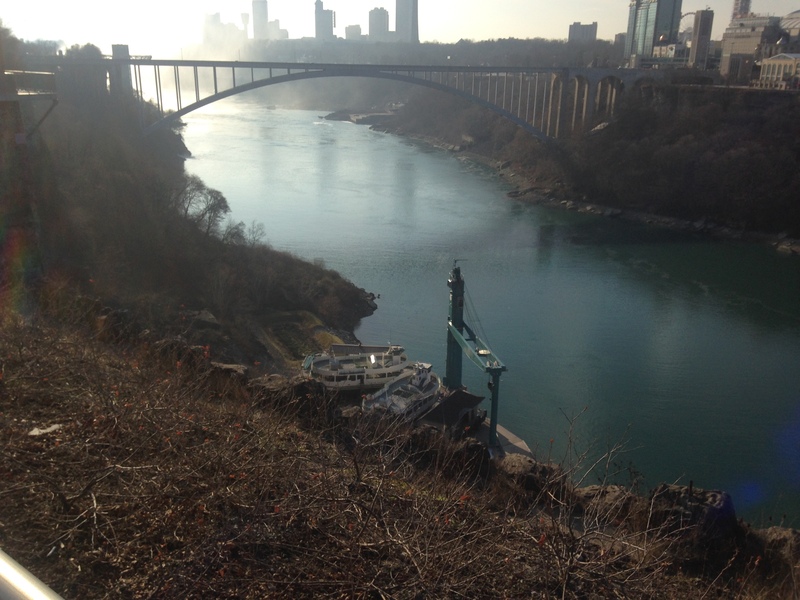 I walked around for about 45 minutes, crossed a bridge to Green Island and then Goat Island and got a view of Niagara from the other side. 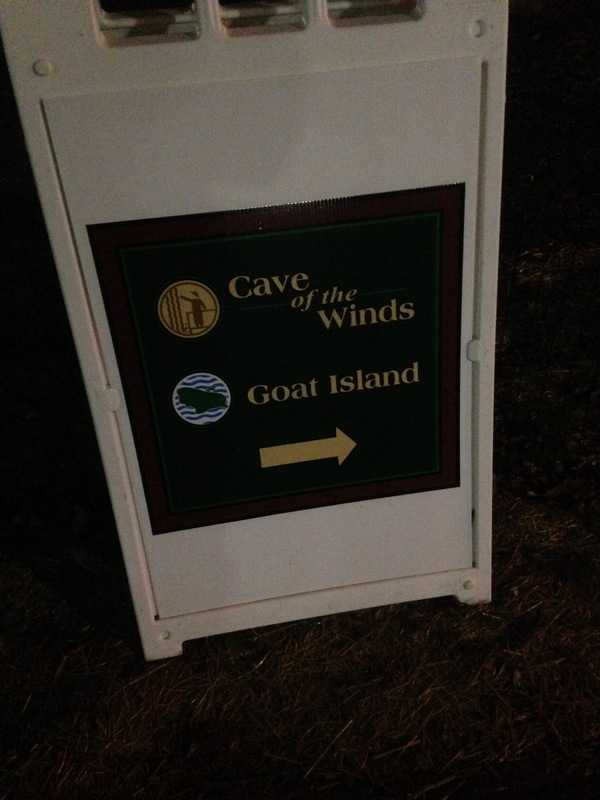 I was getting pretty hungry so I started to head back. I spotted a small family owned hotel and restaurant, which I have forgotten the name of, and stopped in for breakfast. 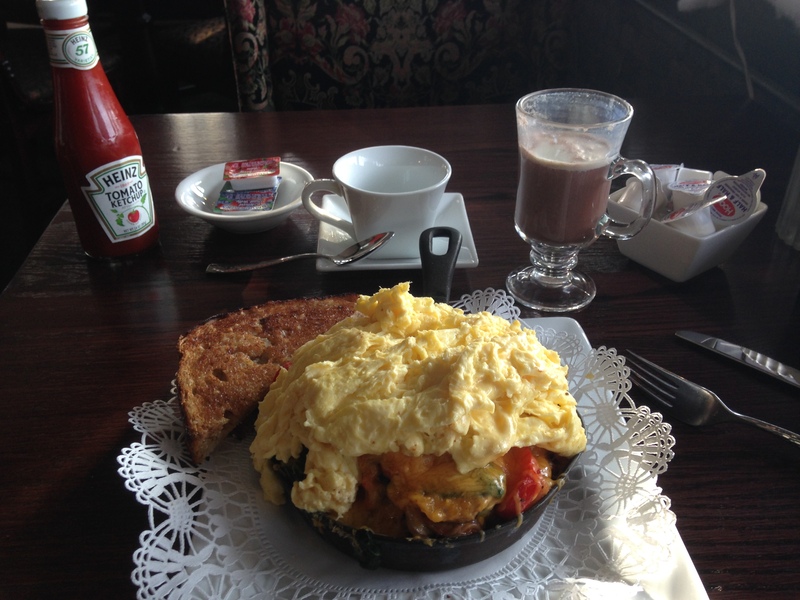 I ordered a veggie skillet with toast. I made small talk with the waitress and she was surprised that I had just driven up, but commented she wished she had that spontaneity. When my breakfast arrived I was stunned how much food it was, there were going to be leftovers. After I finished breakfast and boxed up what was left, I was tired again, so I decided to take a nap. On my way back to my truck, I spotted a Park Police officer and asked him if there were any running trails around, he gave me a few routes to run, I thanked him and then went and took a nap in my truck for about 2 hours. When I woke up the air was much warmer but it was still in the 30’s, it was time for a run. I changed into my running tights and shirt, I took some gloves, hat, and a baclava to cover my face. After about a half mile of running I didn’t need those anymore, my body was warming up and so was the air. 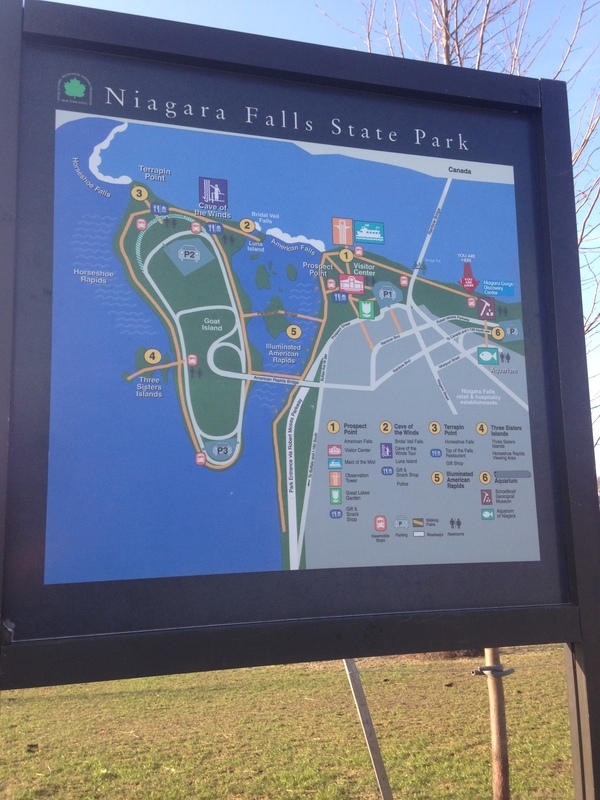 I ran around the American side of Niagara Falls, back to Green Island, Goat Island, and Three Sisters Island which is a bit farther up river. Seeing the falls from so many different angles was great, I had to be careful in some areas because of the ice, the ice closed some trails that were lower down, that was a bit disappointing. 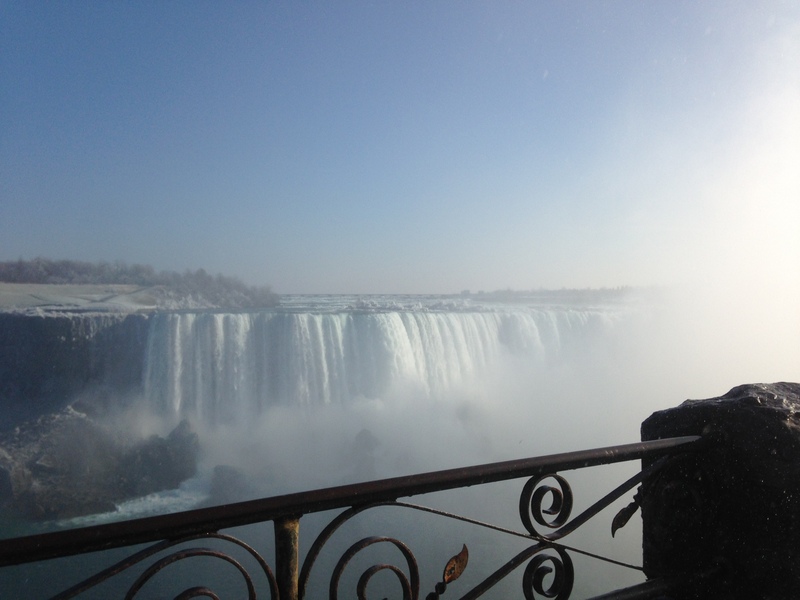 I made my way up to the American observation deck, that was enclosed by glass, it was a bit unnerving but was a great view of the Falls. 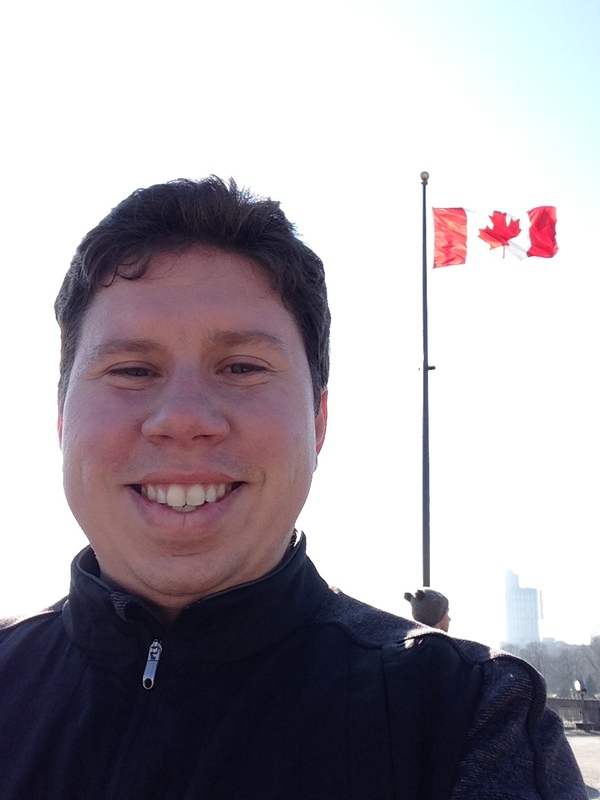 After exploring the American side it was time to make my way over to the Canadian side, I had brought my passport just in case I wanted to go into Canada and after running around, I wanted to see the Falls from the Canadian side too. 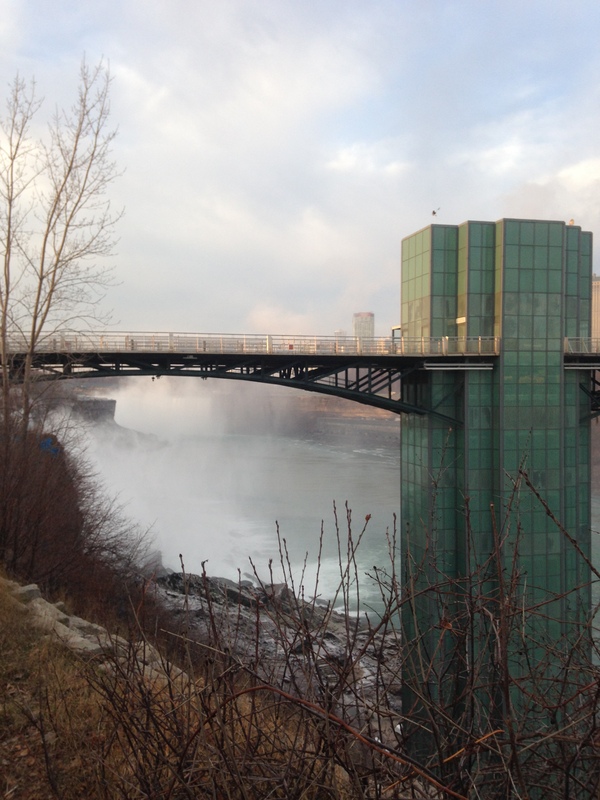 I ran across a long bridge that connects the US and Canada, it was awesome, it was about 300 feet off the water and you could see both the American and Canadian Falls. As I got to the end of the bridge I entered the Customs and Immigration building. To my surprise there wasn’t a line. I walked right up to the Canadian Immigration Officer and handed him my passport. He asked my purpose for visiting and I explained, I think he thought it was odd that I came up just to run for the day, but he didn’t make a big deal about it. What he did make a big deal about was that I had been to Liberia in March. I explained it was before the Ebola outbreak. He asked why I was there, when I told him it was for a medical mission that didn’t help my case. That is when he started to get really concerned. He said he would have to call his supervisor and asked me to stand in the corner by myself. From a distance he asked how I knew I didn’t have Ebola, I went through the entire medical explanation of why it wasn’t possible for me to have it and finished with, “Plus if I had contracted Ebola, I would have died months ago”. I don’t think he found that reassuring and he didn’t share in my love for sarcasm. Finally after about 15 minutes of standing in the corner and watching people pass by he spoke with his supervisor who gave me the all clear to enter Canada. He apologized for the delay and said he was concerned because I came into the building sweating (which can be one sign of Ebola, high fever) and he saw Liberia on my passport and thought the worse. I told him I understood and knew he was only doing his job, with that I was out the door and into Canada! 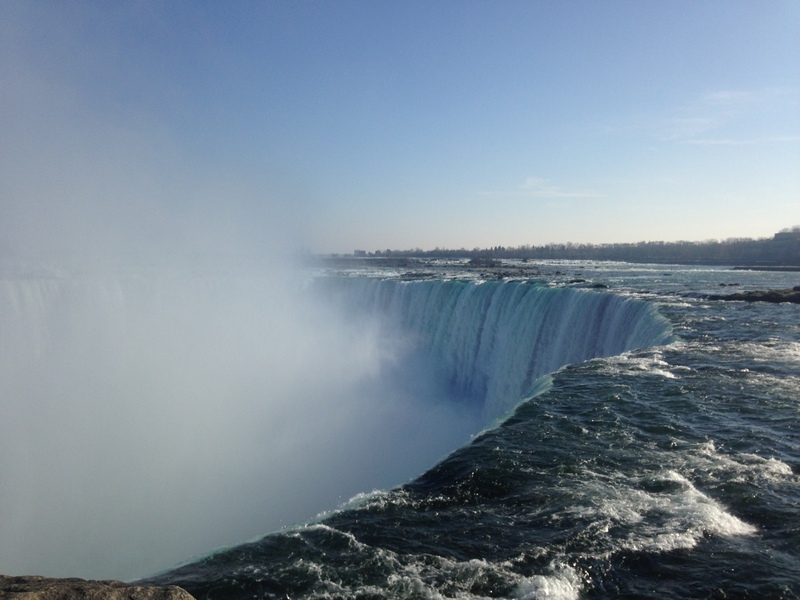 As I made it down to the footpath parallel to Niagara Parkway the Falls came into view, it is true what people say about a better view from the Canadian side. Just an amazing view of the power nature has! I decided to try and FaceTime my Mom and surprise her at where I was, FaceTime didn’t want to cooperate so I called her. When I told her I was in Canada she wasn’t all that surprised, I’ve taken random trips like this before. I text her a few pictures and told her I would be home sometime late that night, as all Moms do she told me to be safe. I started running along the path taking pictures along the way. As I went further along it seemed like it started to rain, but it was actually the mist coming off the falls, you could even see rainbows forming, the mist was that heavy. 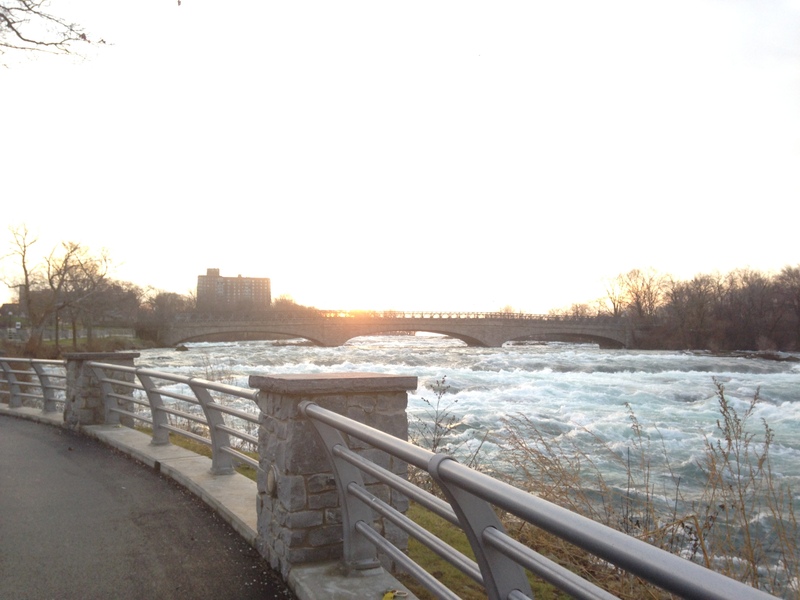 I ran the entire length of the path which stopped on the other side of the Canadian falls a little way up river. I sat for a few minutes took some more pictures and then started to head back. On the way back I wanted to try and avoid the mist and dry out a bit, although I was wet I wasn’t really that could. The sun was shining and even though it was in the 30’s it was a nice day. 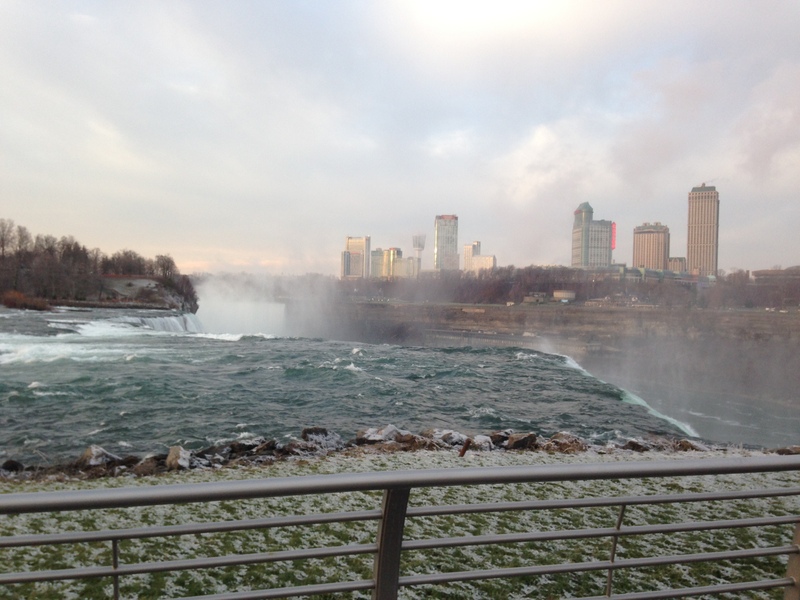 On the way back I stopped in the visitors center and viewed the Falls from there, most of the attractions were closed since it was the middle of winter and a Monday. I made my way back across the bridge and into the US Entry Point building. This is the part of my trip where I got a little irritated, in order to get back into the US, I needed to pay 50 cents for an entry fee. I only had a $20 bill. It was a turn-style booth, like in the subway, but no one was working there. I thought about jumping it but cameras were all over the place. There was a phone off to the side with a number to call for assistance. I called and explained I only had a $20, the person said someone would be up to help me. After waiting for about 10 mins, someone finally came with change and I was back in the US, my pockets 50 cents lighter. It really bothers me as a citizen and a veteran I have to pay to come back to my home country, but I don’t want to digress to much. I entered into the US Customs and Immigration building and approached the customs agent. He looked at my passport, he asked me about Liberia, I went through the whole explanation again. He understood, he asked me how long I had been in Canada, I told him an hour or an hour and a half max, this is when the red flags when up. He asked what I was doing I told him I went for a run, he asked where was my car, I told him where it was parked, he asked where I lived, when I told him Baltimore, we started the whole series of questions again. He also asked me several questions about my motives for coming up here, why only for a day, was I smuggling anything? I felt like telling him, I’m wearing a pretty snug shirt and running tights, where do you think I’m hiding something. Using my better judgement I thought that wouldn’t be a good idea. After about 5 minutes of questioning, he literally threw my passport back at me and told me to proceed through. I was a bit taken back but wasn’t going to let his lack of professionalism bother me. I left the building and ran back to my truck. All total I ran about 6 miles on day #58 with amazing views! 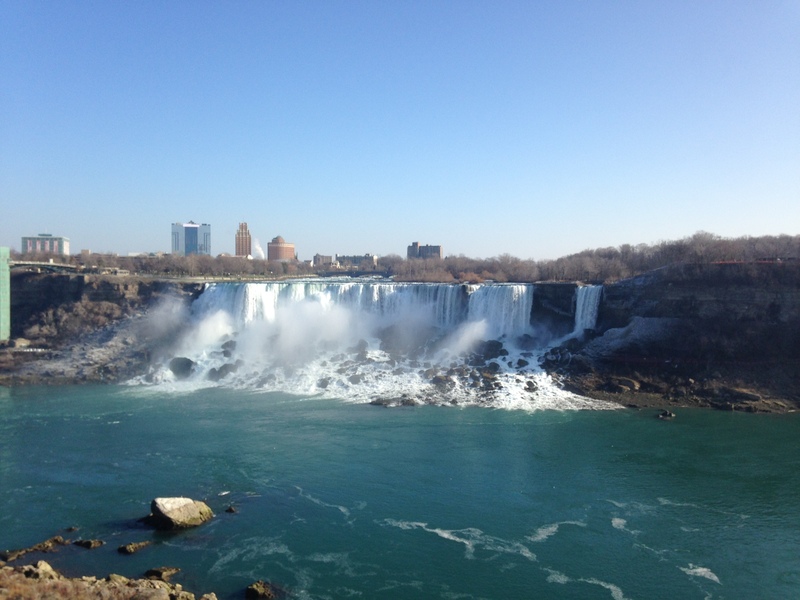 I was glad I decided to be spontaneous and drive up to see Niagara Falls. I changed out of my damp running clothes, finished my leftovers from breakfast and decided to take a nap before driving again. I slept for another 2 hours, when I woke up I took one last walk around and took some final pictures. 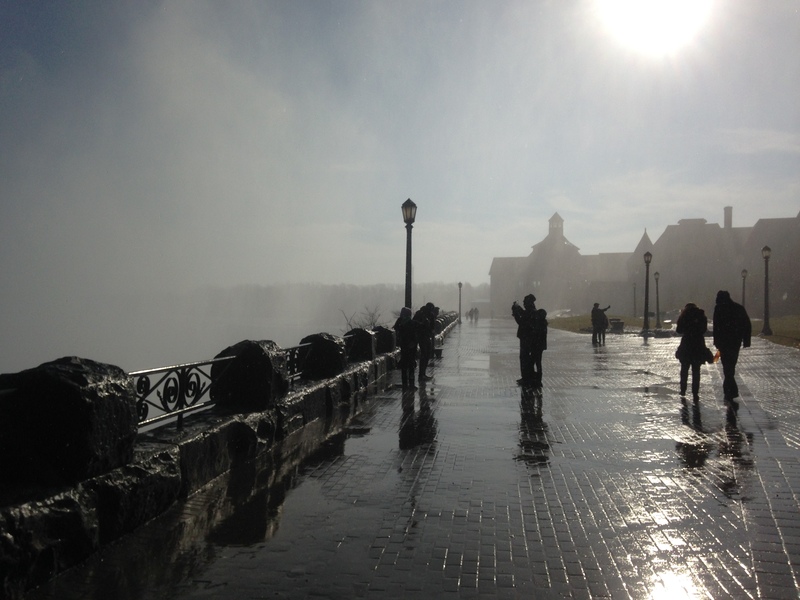 I left Niagara Falls at about 4pm. Other than a little hale on the way home the drive was pretty smooth, I got back at about 10:30pm. It was a day of running to remember! Have you ever taken a spontaneous trip? What is your favorite running adventure? I’d like to hear about it! Ha i still remember hearing the story and I didn’t believe it. The best part is by far your smartass comments to everyone you met along the way. It makes the story 1000x better.